Cucumber is of tropical origin and is sensitive to low temperature. In temperate growing regions or production areas at a high altitude, low temperature germination (LTG) ability is an ideal trait that would allow for early planting. However, the genetic basis for LTG ability in cucumber is poorly understood. In the present study, we conducted QTL analysis for LTG ability using a recombinant inbred line (RIL) population derived from the cross between the LTG tolerant variety Coolgreen and the sensitive inbred line 7088D. Phenotypic data on LTG ability in terms of germinate rate at 13 °C were collected from 138 RILs in five environments which were used in QTL analysis. Three QTL, qLTG1.2, qLTG2.1 and qLTG4.1 on chromosomes 1, 2 and 4, respectively, were consistently detected across multiple environments, which could explain 27.3–52.5% observed total phenotypic variance. The two QTL qLTG1.2 and qLTG2.1 exhibited major- and minor- positive effects on increasing LTG ability, respectively, whereas qLTG4.1 had moderate but negative effect on LTG in this RIL population. Additional QTL analysis using 67 recombinant F2:3 families identified from 602 7088D × Coolgreen F2 plants validated the major-effect QTL qLTG1.2, which also allowed to narrow this QTL down to a region of ~ 348 kb in size. 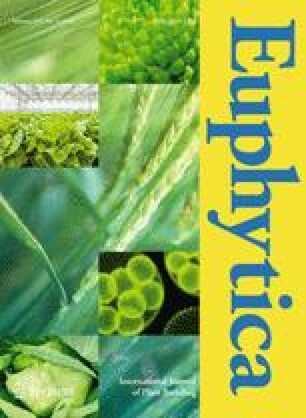 Results from this study provide a basis for further fine mapping and functional study of QTL for low temperature germination in cucumber. The knowledge is also useful for marker-assisted selection in breeding for this trait. The online version of this article ( https://doi.org/10.1007/s10681-019-2408-3) contains supplementary material, which is available to authorized users. Metin Yagcioglu and Biao Jiang have contributed equally to the reported work. The authors thank Kristin Haider for technical help. This research was supported by grants from The Scientific and Technological Research Council of Turkey (TUBITAK) (to SSE) and the National Institute of Food and Agriculture, U.S. Department of Agriculture, under Award Number 2017-67013-26195. USDA is an equal opportunity provider and employer. YQW designed and supervised the experiments. MY, BJ and PW performed the experiments. MY, YHW and YQW analyzed the data and wrote the manuscript with inputs from other co-authors. All authors reviewed and approved this submission.